The Main Square in Krakow is a large, almost 430,000 ft2 square in the very heart of the historic Old Town. It is one of the largest of all grand squares in medieval cities of Europe and is by far the most beautiful. With its many well preserved and colourful townhouses, majestic Cloth Hall in the middle, Gothic St. Mary’s Basilica, mysterious Town Hall Tower and intimate little Church of St. Adalbert, it attracts thousands of visitors. The Main Square in Krakow was created when the city was granted the Magdeburg rights (law of medieval cities) in 1257. The Main Square was erected on the place of previously existing primal commerce hub. It was planned as an almost regular square. There were, however, small exceptions due to the fact that in this place important buildings had already existed. St. Mary’s Basilica, at that time only a Romanesque church, is a proof of that and is located obliquely to the square. The Main Square was designed in such way that three streets lead to it from each side. The only exception is Grodzka Street, which is much older than the Main Square itself. It runs diagonally and connects the Main Square with the Wawel Royal Castle. The Main Square served as a primary market square in the city. The aim to create such a big market square was to make a place for all merchants, both local an coming from abroad. The Main Square was originally in the possession of a current ruler. In 1358 king Casimir III the Great renounced his rights to most of the objects on the Main Square and passed them on to the city. It was his initiative to build the Cloth Hall and the Town Hall to meet infrastructural needs of expanding commercial needs. Thanks to these foundations and the fact that Krakow was a member of the Hanseatic League, the city flourished. The Main Square was a major part of the Royal Road. It was a path that led from the gates to the city in the Barbican to the Wawel Royal Castle. Here, the celebratory parades of honoured guests took place, as well as coronation processions, kings’ and princes’ receptions, etc. The Main Square also served as the main place of executing decrees of the city council, such as death sentences. From its beginning, the Krakow Main Square was not only a bustling trade hub but also a witness to important historical events. In 1364 king Casimir III the Great organised the famous Congress of Krakow, a manifestation of the power of the then Kingdom of Poland. Several European monarchs met to debate on urging diplomatic matters and to celebrate king’s granddaughter marriage to the Holy Roman Emperor, Charles IV. But the event that echoed in history was a feast held by the wealthy merchant, Nicolaus Wierzynek. It probably took place in the townhouse on the Main Square, where now the acclaimed restaurant “Pod Wierzynkiem” is located. It was also on the Krakow Main Square where in 1525 Albert I, Duke of Prussia paid the Prussian Homage to King Sigismund I the Old accepting Polish kings’ suzerainty. In 1683, king Jan III Sobieski celebrated his famous victory over the Turkish Empire in the Battle of Vienna. Here, in 1794, Tadeusz Kosciuszko swore an oath to the Nation starting an insurrection. 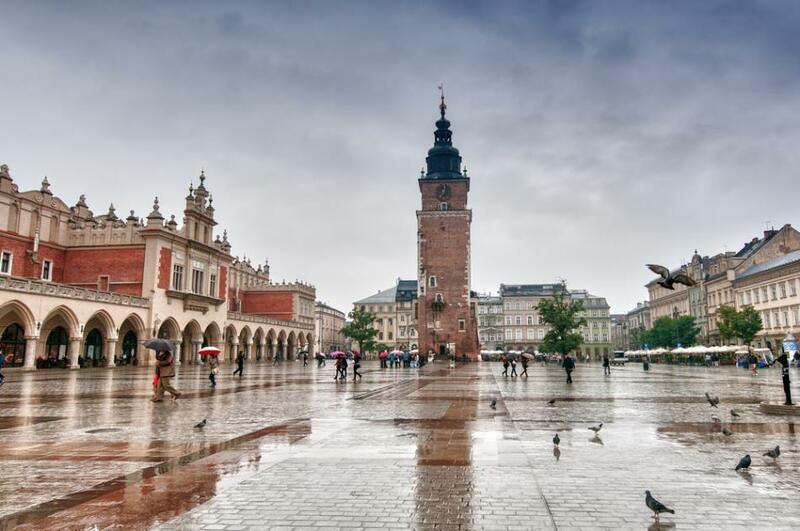 The Main Square in Krakow was a witness of fights during the Spring of Nations in 1848 and of celebrations after regaining of independence in 1918. During World War II the Main Square was renamed Adolf Hitler-Platz. After the war protests against the communist government took place here. The Main Square was central in staging mass demonstrations of the Solidarity movement. Church of St. Adalbert, a mysterious little church in the southern part of the square. Now Baroque, it is the oldest existing building in the Main Square, dating back to the 10th century. The Main Square is surrounded by 47 well-preserved townhouses, many of them of great historical value. 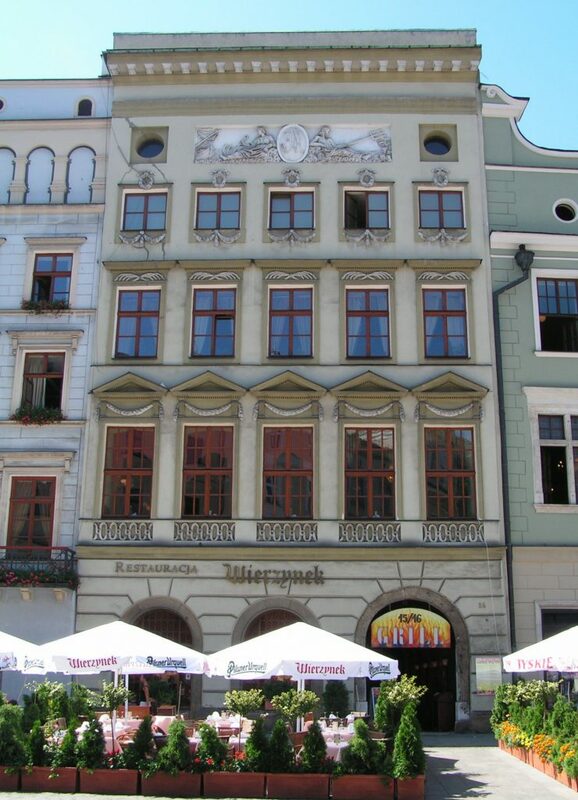 In the townhouses under numbers 15, 16 and 17, the aforementioned restaurant “Pod Wierzynkiem” is located. Krzysztofory Palace, nr 35, houses a branch of the Historical Museum of Krakow. Its ground floor is occupied by a popular restaurant “Pod Palmą”, founded by Antoni Hawelka in the second half of the 19th century. Number 25, 19th-century townhouse commonly called “Pod Kruki” is occupied by International Cultural Center. Numerous cafes and restaurants on the Main Square welcome thousands of visitors each day. For the most part of the year, tables are set outside to allow admiring of the beautiful scenery. Underneath the buildings of the Main Square, there are large basements and underground passageways. Most of the basements were turned into restaurants, cafes, pubs, etc., the most famous of which is “Piwnica pod Baranami”. The Main Square is also the main venue for city events, such as Christmas markets, New Year’s feasts, summer concerts, and festivals, etc. One of the most popular features of the Main Square is fiacres. They first appeared in the 1830s as rented carriages. Now, they offer tours around the Old Town and to the Wawel Royal Castle. Also, a large population of rock pigeons is a permanent element of the scenery of the Main Square. 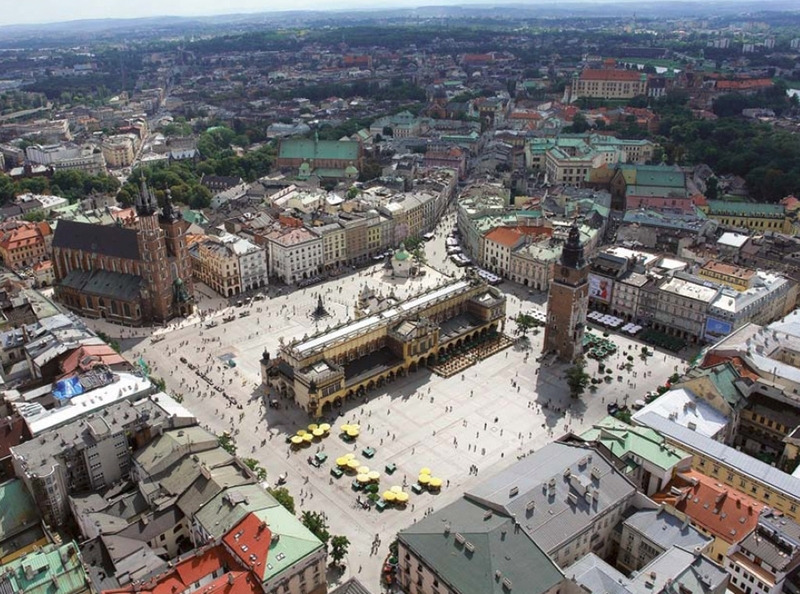 In the Krakow Main Square archaeological research had been conducted for many years. In the result of excavations, medieval tracks were discovered, as well as remains of the original stalls of the Cloth Hall. In a special exhibition prepared by the Historical Museum of Krakow, called Rynek Underground, visitors follow the excavated tracks to see how Krakow looked like in the Middle Ages.